Weston's Kip McMahon controls the ball during Thursday's lacrosse game against Masuk at Weston High School on April 21, 2011. 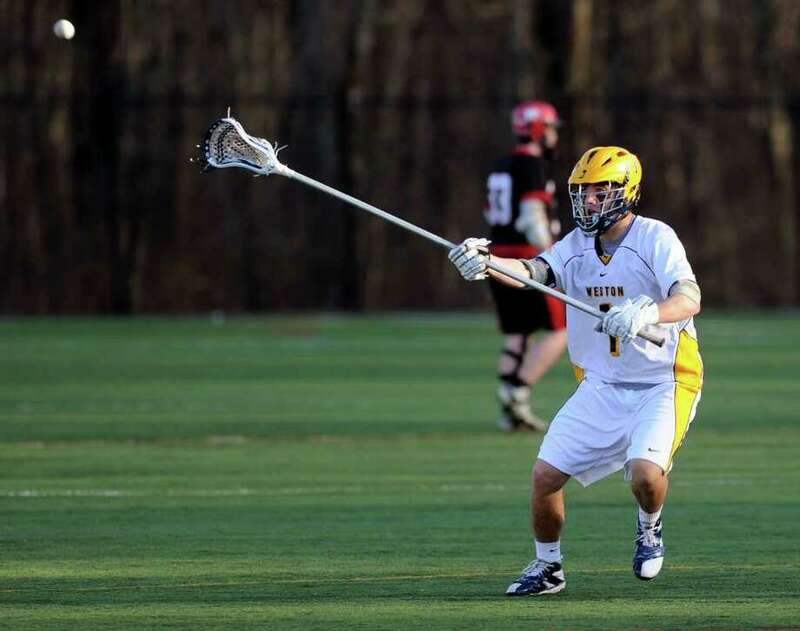 After a blazing 7-0 start to the 2011 season, the Weston boys lacrosse team has suffered two crushing losses in a row. The Trojans were roughed up Tuesday by SWC rival New Fairfield, 13-3 on the road. Last Saturday, Weston was outplayed by a strong and fast Huntington Long Island team 9-5 in a non-league road game. "We've just played two very good teams and been beaten soundly by both," Trojans Coach John Mathews said. "The toughest part of our schedule is in front of us and we have a number of injuries. We've got our work cut out for ourselves." Playing at home, New Fairfield (8-0 overall, 4-0 SWC) came out fast scoring two goals in the first four minutes and pressuring the undermanned Trojans all game long. Both Trojan goalies, Alex Peyreigne (13 saves) and Grant Limone (three saves) were used in the contest. Weston's top-scorer junior Lyle Mitchell picked up two goals and was helped by Jack Scheuffele's assist, but that wasn't nearly enough to keep the Trojans in the contest. Senior tri-captain Eddie Hutchins also scored a goal for Weston. "Even though we've scored a lot of goals this season, we're not consistent and we give up too many turnovers," Mathews said. As Mathews said, things aren't going to get easier for the Trojans as they go up against Staples on the Wreckers turf field today at 5:30 p.m. and then travel to Joel Barlow for a game on Monday.